There is little consensus on the impacts and efficacy of proposed carbon dioxide removal (CDR) methods as a potential means of mitigating climate change. To address this need, the Carbon Dioxide Removal Model Intercomparison Project (or CDR-MIP) has been initiated. This project brings together models of the Earth system in a common framework to explore the potential, impacts, and challenges of CDR. Here, we describe the first set of CDR-MIP experiments. Recent studies have identified an approximately proportional relationship between global warming and cumulative carbon emissions. This relationship – referred to as the transient climate response to cumulative carbon emissions (TCRE) – is useful for climate policy applications. We show that the TCRE is constant for cumulative emissions lower than ~1500GtC but declines for higher cumulative emissions. We also find the TCRE to decrease with increasing emission rate. Based on a simple statistical model we show that the September sea ice extent has a high predictive skill, up to 4 months ahead, based on previous months' oceanic and atmospheric conditions. 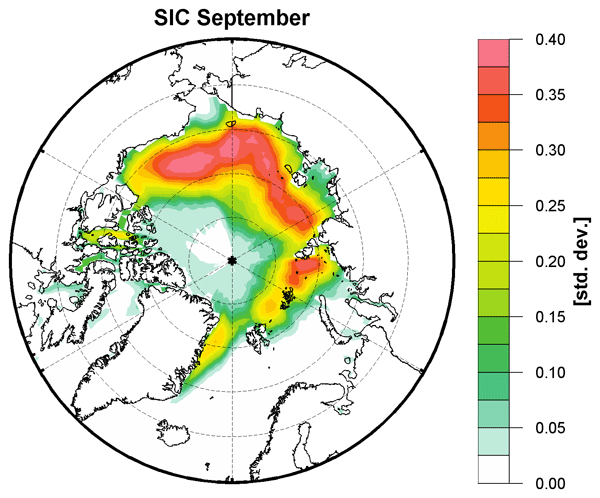 Our statistical model skillfully captures the interannual variability of the September sea ice extent and could provide a valuable tool for identifying relevant regions and oceanic and atmospheric parameters that are important for the sea ice development in the Arctic. Best estimates of future climate projections typically rely on a range of climate models from different international research institutions. However, it is unclear how independent these different estimates are, and, for example, the degree to which their agreement implies robustness. This work presents a review of the varied and disparate attempts to quantify and address model dependence within multi-model climate projection ensembles. This paper shows that the absorption of carbon dioxide by the ocean is predictable several years in advance. This is important because fossil-fuel-derived carbon dioxide is largely responsible for anthropogenic global warming and because carbon dioxide emission management and global carbon cycle budgeting exercises can benefit from foreknowledge of ocean carbon absorption. The promising results from this new forecast system justify the need for additional oceanic observations. The effect of human activities on the probability of winter wind storms like the ones that occurred in Western Europe in January 2018 is analyzed using multiple model ensembles. Despite a significant probability decline in observations, we find no significant change in probabilities due to human influence on climate so far. However, such extreme events are likely to be slightly more frequent in the future. The observed decrease in storminess is likely to be due to increasing roughness. State-of-the-art climate models sometimes differ in their prediction of key aspects of climate change. The technique of emergent constraints uses observations of current climate to improve those predictions, using relationships between different climate models. Our paper first classifies the different uses of the technique, and continues with proposing a mathematical justification for their use. 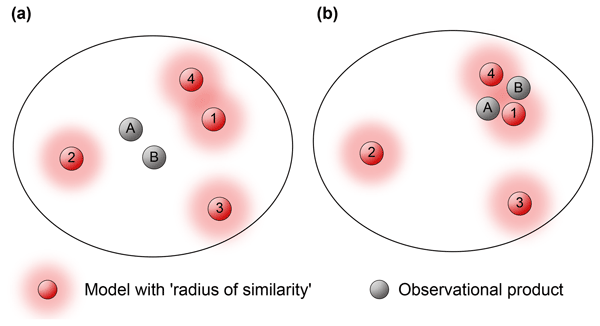 We also highlight when the application of emergent constraints might give biased predictions. We find that CMIP5 models show more significant improvement in predicting zonal winds with initialisation than without initialisation based on the knowledge that zonal wind indices can be used as potential predictors for the EASM. Given the initial conditions, two models improve the seasonal prediction skill of the EASM, while one model decreases it. The models have different responses to initialisation due to their ability to depict the EASM–ESNO coupled mode. A novel method based on present–future relationship in observed climate and model-simulated future climate is applied to give more reliable projections of East Asian summer monsoon intensity and associated precipitation changes at 1.5 and 2 °C warming levels. 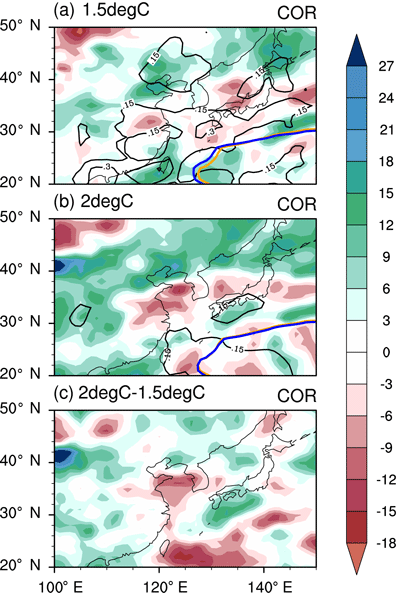 Projected future changes suggest decreased precipitation over the Meiyu belt and increased precipitation over the high latitudes of East Asia and central China, together with a considerable weakening of EASM intensity. The United Nations Framework Convention on Climate Change challenged the scientific community to describe the impacts of stabilizing the global temperature at its 21st Conference of Parties. A specific target of 1.5 °C above preindustrial levels had not been seriously considered by the climate modeling community prior to the Paris Agreement. This paper analyzes heat waves in simulations designed for this target. We find there are reductions in extreme temperature compared to a 2 °C target. Assessing projected hydroclimatological changes is crucial, but associated with large uncertainties. We statistically assess here the response of precipitation and water availability to global temperature change, enabling us to estimate the significance of drying/wetting tendencies under anthropogenic climate change. We further show that opting for a 1.5 K warming target just slightly influences the mean response but could substantially reduce the risk of experiencing extreme changes. The United Nations Framework Convention on Climate Change invited the scientific community to explore the impacts of a world in which anthropogenic global warming is stabilized at only 1.5 °C above preindustrial average temperatures. We present a projection of future tropical cyclone statistics for both 1.5 and 2.0 °C stabilized warming scenarios using a high-resolution global climate model. We find more frequent and intense tropical cyclones, but a reduction in weaker storms. Users presented with large multi-model ensembles commonly use the equally weighted model mean as a best estimate, ignoring the issue of near replication of some climate models. We present an efficient and flexible tool that finds a subset of models with improved mean performance compared to the multi-model mean while at the same time maintaining the spread and addressing the problem of model interdependence. Out-of-sample skill and reliability are demonstrated using model-as-truth experiments. The southern part of Pakistan (Sindh province) has been exposed to frequent and intense temperature extremes recently and is highly vulnerable to their impacts due to lack of information on recurrence of extremes. In this paper for the first time we estimated the return levels of daily maximum temperatures and daily maximum wet-bulb temperatures over the different return periods in Sindh, which would help the local administrations to prioritize the regions in terms of adaptations. The concept of independence has been frequently raised in climate science, but has rarely been defined and discussed in a theoretically robust and quantifiable manner. Improved understanding of this topic is critical to better understanding of climate change. In this paper, we introduce a unifying approach based on the statistical definition of independence, and illustrate with simple examples how it can be applied to practical questions. Thermal continentality plays an important role not only in the basic characterisation of the climate in particular regions but also in the phytogeographic distribution of plants and ecosystem formation. Due to ongoing climate change, questions surrounding the changes of thermal continentality are very relevant. Our results show that the continentality of Slovakia increased in the period 1961 to 2013; however, this trend is not significant. This study evaluates the lifetime of soil moisture perturbations using an atmosphere-land GCM. We find memory of up to 9 months for root zone soil moisture. Interactions with other surface states result in significant but short-lived anomalies in surface temperature and more stable anomalies in leaf carbon content. As these anomalies can recur repeatedly, e.g. due to interactions with a deep-soil moisture reservoir, we conclude that soil moisture initialization may impact climate predictions. Numerical climate models forecast the weather well beyond the deterministic limit. In this “macroweather” regime, they are random number generators. Stochastic models can have more realistic noises and can be forced to converge to the real-world climate. Existing stochastic models do not exploit the very long atmospheric and oceanic memories. With skill up to decades, our new ScaLIng Macroweather Model (SLIMM) exploits this to make forecasts more accurate than GCMs. Aviation impacts on climate via contrails, which are often clearly visible in the sky. Contrail formation requires particular cold/moist atmospheric conditions at aircraft cruise altitudes. Climate change is expected to change these conditions. Using simulations from several climate models we conclude that, by 2100, the probability of contrail formation could decrease from 11 to 7%, mostly due to changing conditions in the tropics. There is no consensus on the likely change in mid-latitudes. This study shows the impact of a changing climate on hydrological drought. The study illustrates that an alternative drought identification that considers adaptation to an altered hydrological regime has a substantial influence on the way in which drought impact is calculated. The obtained results show that an adaptive threshold approach is the way forward to study the impact of climate change on the identification and characterization of hydrological drought events. Do GCMs predict the climate ... or macroweather? 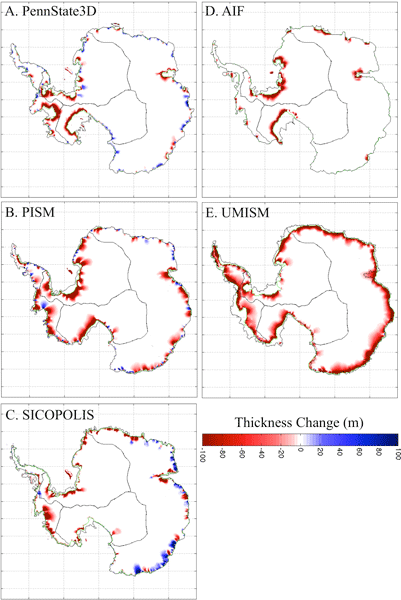 Armour, K. C., Marshall, J., Scott, J. R., Donohoe, A., and Newsom, E. R.: Southern Ocean warming delayed by circumpolar upwelling and equatorward transport, Nat. Geosci., 9, 549–554, 2016. Boucher, O., Halloran, P. R., Burke, E. J., Doutriaux-Boucher, M., Jones, C. D., Lowe, J., Ringer, M. A., Robertson, E., and Wu, P.: Reversibility in an Earth System model in response to CO2 concentration changes, Environ. Res. Lett., 7, 024013, https://doi.org/10.1088/1748-9326/7/2/024013, 2012. Bouttes, N., Gregory, J. M., and Lowe, J. A.: The Reversibility of Sea Level Rise, J. Climate, 26, 2502–2513, https://doi.org/10.1175/JCLI-D-12-00285.1, 2013. Bouttes, N., Good, P., Gregory, J. M., and Lowe, J. A.: Nonlinearity of ocean heat uptake during warming and cooling in the FAMOUS climate model, Geophys. Res. Lett., 42, 2409–2416, https://doi.org/10.1002/2014GL062807, 2015. Bryan, K. and Lewis, L.: A water mass model of the world ocean, J. Geophys. Res., 84, 2503–2517, 1979. Church, J., Clark, P., Cazenave, A., Gregory, J., Jevrejeva, S., Levermann, A., Merrifield, M., Milne, G., Nerem, R., Nunn, P., Payne, A., Pfeffer, W., Stammer, D., and Unnikrishnan, A.: Sea Level Change, in: Climate Change 2013: The Physical Science Basis, Contribution of Working Group I to the Fifth Assessment Report of the Intergovernmental Panel on Climate Change, book section 13, edited by: Stocker, T., Qin, D., Plattner, G.-K., Tignor, M., Allen, S., Boschung, J., Nauels, A., Xia, Y., Bex, V., and Midgley, P., Cambridge University Press, Cambridge, United Kingdom and New York, NY, USA, 1137–1216, available at: www.climatechange2013.org, 2013. Clark, P. U., Shakun, J. D., Marcott, S. A., Mix, A. C., Eby, M., Kulp, S., Levermann, A., Milne, G. A., Pfister, P. L., Santer, B. D., Schrag, D. P., Solomon, S., Stocker, T. F., Strauss, B. H., Weaver, A. J., Winkelmann, R., Archer, D., Bard, E., Goldner, A., Lambeck, K., Pierrehumbert, R. T., and Plattner, G.-K.: Consequences of twenty-first-century policy for multi-millennial climate and sea-level change, Nat. Clim. Change, 6, 360–369, https://doi.org/10.1038/nclimate2923, 2016. Collins, M., Knutti, R., Arblaster, J., Dufresne, J.-L., Fichefet, T., Friedlingstein, P., Gao, X., Gutowski, W., Johns, T., Krinner, G., Shongwe, M., Tebaldi, C., Weaver, A., and Wehner, M.: Long-term Climate Change: Projections, Commitments and Irreversibility, in: Climate Change 2013: The Physical Science Basis, Contribution of Working Group I to the Fifth Assessment Report of the Intergovernmental Panel on Climate Change, book section 12, edited by: Stocker, T., Qin, D., Plattner, G.-K., Tignor, M., Allen, S., Boschung, J., Nauels, A., Xia, Y., Bex, V., and Midgley, P., Cambridge University Press, Cambridge, United Kingdom and New York, NY, USA, 1029–1136, available at: www.climatechange2013.org, 2013. Cox, P. M.: Description of the TRIFFID dynamic global vegetation model: Hadley Centre Technical Note 24, Hadley Centre technical note 24, Hadley Centre, Met Office, Berks, UK, 2001. Cox, P. M., Betts, R. A., Bunton, C. B., Essery, R. L. H., Rowntree, P. R., and Smith, J.: The impact of new land surface physics on the GCM simulation of climate and climate sensitivity, Clim. Dynam., 15, 183–203, https://doi.org/10.1007/s003820050276, 1999. 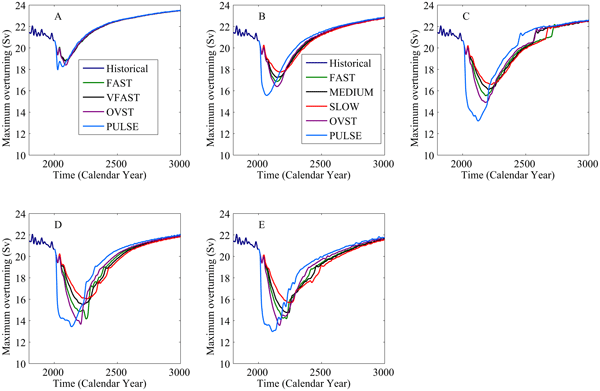 Eby, M., Zickfeld, K., Montenegro, A., Archer, D., Meissner, K. J., and Weaver, A. J.: Lifetime of anthropogenic climate change: millennial time scales of potential CO2 and surface temperature Perturbations, J. Climate, 22, 2501–2511, https://doi.org/10.1175/2008JCLI2554.1, 2009. Eby, M., Weaver, A. J., Alexander, K., Zickfeld, K., Abe-Ouchi, A., Cimatoribus, A. A., Crespin, E., Drijfhout, S. S., Edwards, N. R., Eliseev, A. V., Feulner, G., Fichefet, T., Forest, C. E., Goosse, H., Holden, P. B., Joos, F., Kawamiya, M., Kicklighter, D., Kienert, H., Matsumoto, K., Mokhov, I. I., Monier, E., Olsen, S. M., Pedersen, J. O. P., Perrette, M., Philippon-Berthier, G., Ridgwell, A., Schlosser, A., Schneider von Deimling, T., Shaffer, G., Smith, R. S., Spahni, R., Sokolov, A. P., Steinacher, M., Tachiiri, K., Tokos, K., Yoshimori, M., Zeng, N., and Zhao, F.: Historical and idealized climate model experiments: an intercomparison of Earth system models of intermediate complexity, Clim. Past, 9, 1111–1140, https://doi.org/10.5194/cp-9-1111-2013, 2013. Ehlert, D. and Zickfeld, K.: Model data “Irreversible ocean thermal expansion under carbon dioxide removal”, https://doi.org/10.20383/101.021, 2018. Ehlert, D., Zickfeld, K., Eby, M., and Gillett, N.: The Sensitivity of the Proportionality between Temperature Change and Cumulative CO2 Emissions to Ocean Mixing, J. Climate, 30, 2921–2935, https://doi.org/10.1175/JCLI-D-16-0247.1, 2017. Fuss, S., Jones, C. D., Kraxner, F., Peters, G. P., Smith, P., Tavoni, M., van Vuuren, D. P., Canadell, J. G., Jackson, R. B., Milne, J., Moreira, J. R., Nakicenovic, N., Sharifi, A., and Yamagata, Y.: Research priorities for negative emissions, Environ. Res. Lett., 11, 115007, https://doi.org/10.1088/1748-9326/11/11/115007, 2016. Gent, P. R. and McWilliams, J. C.: Isopycnal mixing in ocean circulation models, J. Phys. Oceanogr., 20, 150–155, https://doi.org/10.1175/1520-0485(1990)020<0150:IMIOCM>2.0.CO;2, 1990. Geoffroy, O., Saint-Martin, D., Olivié, D. J. L., Voldoire, A., Bellon, G., and Tytéca, S.: Transient climate response in a two-layer energy-balance model, Part I: Analytical solution and parameter calibration using CMIP5 AOGCM experiments, J. Climate, 26, 1841–1857, https://doi.org/10.1175/JCLI-D-12-00195.1, 2013. Gillett, N. P., Arora, V. K., Zickfeld, K., Marshall, S. J., and Merryfield, W. J.: Ongoing climate change following a complete cessation of carbon dioxide emissions, Nat. Geosci., 4, 83–87, https://doi.org/10.1038/ngeo1047, 2011. Goes, M., Urban, N. M., Tonkonojenkov, R., Haran, M., Schmittner, A., and Keller, K.: What is the skill of ocean tracers in reducing uncertainties about ocean diapycnal mixing and projections of the Atlantic Meridional Overturning Circulation?, J. Geophys. Res.-Oceans, 115, C12006, https://doi.org/10.1029/2010JC006407, 2010. Gregory, J. M.: Vertical heat transports in the ocean and their effect on time-dependent climate change, Clim. Dynam., 16, 501–515, https://doi.org/10.1007/s003820000059, 2000. Hansen, J., Sato, M., Kharecha, P., and von Schuckmann, K.: Earth's energy imbalance and implications, Atmos. Chem. Phys., 11, 13421–13449, https://doi.org/10.5194/acp-11-13421-2011, 2011. Knutti, R. and Stocker, T. F.: Influence of the thermohaline circulation on projected sea level rise, J. Climate, 13, 1997–2001, https://doi.org/10.1175/1520-0442(2000)013<1997:IOTTCO>2.0.CO;2, 2000. Levermann, A., Griesel, A., Hofmann, M., Montoya, M., and Rahmstorf, S.: Dynamic sea level changes following changes in the thermohaline circulation, Clim. Dynam., 24, 347–354, https://doi.org/10.1007/s00382-004-0505-y, 2005. Liu, W., Xie, S.-P., and Lu, J.: Tracking ocean heat uptake during the surface warming hiatus, Nat. Commun., 7, 10926, https://doi.org/10.1038/ncomms10926, 2016. Liu, W., Xie, S.-P., Liu, Z., and Zhu, J.: Overlooked possibility of a collapsed Atlantic Meridional Overturning Circulation in warming climate, Science Advances, 3, e1601666, https://doi.org/10.1126/sciadv.1601666, 2017. MacDougall, A. H.: Reversing climate warming by artificial atmospheric carbon-dioxide removal: can a Holocene-like climate be restored?, Geophys. Res. Lett., 40, 5480–5485, https://doi.org/10.1002/2013GL057467, 2013. MacDougall, A. H., Zickfeld, K., Knutti, R., and Matthews, H. D.: Sensitivity of carbon budgets to permafrost carbon feedbacks and non-CO 2 forcings, Environ. Res. Lett., 10, 125003, http://stacks.iop.org/1748-9326/10/i=12/a=125003, 2015. Marshall, J. and Speer, K.: Closure of the meridional overturning circulation through Southern Ocean upwelling, Nat. Geosci., 5, 171–180, 2012. Matthews, H. D. and Caldeira, K.: Stabilizing climate requires near-zero emissions, Geophys. Res. Lett., 35, L04705, https://doi.org/10.1029/2007GL032388, 2008. Matthews, H. D. and Zickfeld, K.: Climate response to zeroed emissions of greenhouse gases and aerosols, Nat. Clim. Change, 2, 338–341, https://doi.org/10.1038/nclimate1424, 2012. Meehl, G., Stocker, T. F., Collins, W., Friedlingstein, P., Gaye, A., Gregory, J., Kitoh, A., Knutti, R., Murphy, J., Noda, A., Raper, S. C. B., Watterson, I., Weaver, A., and Zhao, Z.-C.: Global Climate Projections, in: Climate Change 2007: Contribution of Working Group I to the Fourth Assessment Report of the Intergovernmental Panel on Climate Change, chap. 10, edited by: Solomon, S., Qin, D., Manning, M., Chen, Z., Marquis, M., Averyt, K. B., Tignor, M., and Miller, H. L., Cambridge University Press, Cambridge, United Kingdom and New York, NY, USA, 747–846, available at: http://www.ipcc.ch/pdf/assessment-report/ar4/wg1/ar4-wg1-chapter10.pdf, 2007. Meinshausen, M., Smith, S. J., Calvin, K., Daniel, J. S., Kainuma, M. L. T., Lamarque, J.-F., Matsumoto, K., Montzka, S. A., Raper, S. C. B., Riahi, K., Thomson, A., Velders, G. J. M., and Vuuren, D. P.: The RCP greenhouse gas concentrations and their extensions from 1765 to 2300, Climatic Change, 109, 213–241, https://doi.org/10.1007/s10584-011-0156-z, 2011. Meissner, K. J., Weaver, a. J., Matthews, H. D., and Cox, P. M.: The role of land surface dynamics in glacial inception: a study with the UVic Earth System Model, Clim. Dynam., 21, 515–537, https://doi.org/10.1007/s00382-003-0352-2, 2003. National Research Council: Climate Intervention: Carbon Dioxide Removal and Reliable Sequestration, The National Academies Press, Washington, DC, 2015. Paris Agreement: United Nations Framework Convention on Climate Change, Paris Agreement, http://unfccc.int/files/essential_background/convention/application/pdf/english_paris_agreement.pdf, last access: 1 February 2016, 2015. Peters, G. P., Andrew, R. M., Solomon, S., and Friedlingstein, P.: Measuring a fair and ambitious climate agreement using cumulative emissions, Environ. Res. Lett., 10, 105004, https://doi.org/10.1088/1748-9326/10/10/105004, 2015. Purkey, S. G. and Johnson, G. C.: Global contraction of antarctic bottom water between the 1980s and 2000s, J. Climate, 25, 5830–5844, https://doi.org/10.1175/JCLI-D-11-00612.1, 2012. Rahmstorf, S.: Thermohaline Ocean Circulation, in: Encyclopedia of Quaternary Sciences, edited by: Elias, S. A., Elsevier, Amsterdam, 1–10, 2006. Rahmstorf, S.: A semi-empirical approach to projecting future sea-level rise, Science, 315, 368–370, https://doi.org/10.1126/science.1135456, 2007. Robinson, A., Calov, R., and Ganopolski, A.: Multistability and critical thresholds of the Greenland ice sheet, Nat. Clim. Change, 2, 429–432, https://doi.org/10.1038/nclimate1449, 2012. Rogelj, J., den Elzen, M., Höhne, N., Fransen, T., Fekete, H., Winkler, H., Schaeffer, R., Sha, F., Riahi, K., and Meinshausen, M.: Paris agreement climate proposals need a boost to keep warming well below 2 °C, Nature, 534, 631–639, https://doi.org/10.1038/nature18307, 2016a. Ross, A., Matthews, H. D., Schmittner, A., and Kothavala, Z.: Assessing the effects of ocean diffusivity and climate sensitivity on the rate of global climate change, Tellus B, 64, 1–10, https://doi.org/10.3402/tellusb.v64i0.17733, 2012. Schmittner, A., Oschlies, A., Giraud, X., Eby, M., and Simmons, H. L.: A global model of the marine ecosystem for long-term simulations: Sensitivity to ocean mixing, buoyancy forcing, particle sinking, and dissolved organic matter cycling, Global Biogeochem. Cy., 19, GB3004, https://doi.org/10.1029/2004GB002283, 2005. 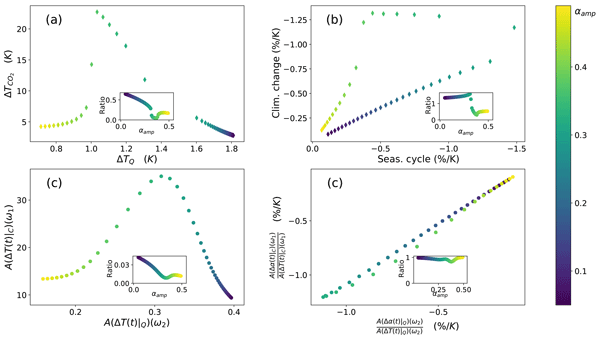 Schmittner, A., Urban, N. M., Keller, K., and Matthews, D.: Using tracer observations to reduce the uncertainty of ocean diapycnal mixing and climate-carbon cycle projections, Global Biogeochem. Cy., 23, gB4009, https://doi.org/10.1029/2008GB003421, 2009. Smith, P., Davis, S. J., Creutzig, F., Fuss, S., Minx, J., Gabrielle, B., Kato, E., Jackson, R. B., Cowie, A., Kriegler, E., van Vuuren, D. P., Rogelj, J., Ciais, P., Milne, J., Canadell, J. G., McCollum, D., Peters, G., Andrew, R., Krey, V., Shrestha, G., Friedlingstein, P., Gasser, T., Grübler, A., Heidug, W. K., Jonas, M., Jones, C. D., Kraxner, F., Littleton, E., Lowe, J., Moreira, J. R. J. R., Nakicenovic, N., Obersteiner, M., Patwardhan, A., Rogner, M., Rubin, E., Sharifi, A., Torvanger, A. A., Yamagata, Y., Edmonds, J., Yongsung, C., Grubler, A., Heidug, W. K., Jonas, M., Jones, C. D., Kraxner, F., Littleton, E., Lowe, J., Moreira, J. R. J. R., Nakicenovic, N., Obersteiner, M., Patwardhan, A., Rogner, M., Rubin, E., Sharifi, A., Torvanger, A. A., Yamagata, Y., Edmonds, J., and Yongsung, C.: Biophysical and economic limits to negative CO2 emissions, Nat. Clim. Change, 6, 42–50, https://doi.org/10.1038/nclimate2870, 2016. Stocker, T. and Schmittner, A.: Influence of CO2 emission rates on the stability of the thermohaline circulation, Nature, 388, 862–865, 1997. Tavoni, M. and Socolow, R.: Modeling meets science and technology: an introduction to a special issue on negative emissions, Climatic Change, 118, 1–14, https://doi.org/10.1007/s10584-013-0757-9, 2013. Tokarska, K. B. and Zickfeld, K.: The effectiveness of net negative carbon dioxide emissions in reversing anthropogenic climate change, Environ. Res. Lett., 10, 094013, https://doi.org/10.1088/1748-9326/10/9/094013, 2015. Trossman, D. S., Palter, J. B., Merlis, T. M., Huang, Y., and Xia, Y.: Large-scale ocean circulation-cloud interactions reduce the pace of transient climate change, Geophys. Res. Lett., 43, 3935–3943, https://doi.org/10.1002/2016GL067931, 2016. UVic ESCM Developers Group: UVic ESCM 2.9, available at: http://climate.uvic.ca/model/2.9/, last access: 19 February 2018. Weaver, A. J., Eby, M., Wiebe, E. C., Bitz, C. M., Duffy, P. B., Ewen, T. L., Fanning, A. F., Holland, M. M., MacFadyen, A., Matthews, H. D., Meissner, K. J., Saenko, O., Schmittner, A., Wang, H., and Yoshimori, M.: The UVic earth system climate model: Model description, climatology, and applications to past, present and future climates, Atmos. Ocean, 39, 361–428, https://doi.org/10.1080/07055900.2001.9649686, 2001. Wu, P., Wood, R., Ridley, J., and Lowe, J.: Temporary acceleration of the hydrological cycle in response to a CO2 rampdown, Geophys. Res. Lett., 37, L12705, https://doi.org/10.1029/2010GL043730, 2010. Wu, P., Jackson, L., Pardaens, A., and Schaller, N.: Extended warming of the northern high latitudes due to an overshoot of the Atlantic meridional overturning circulation, Geophys. Res. Lett., 38, 1–5, https://doi.org/10.1029/2011GL049998, 2011. Zickfeld, K., Eby, M., Alexander, K., Weaver, A. J., Crespin, E., Fichefet, T., Goosse, H., Philippon-Berthier, G., Edwards, N. R., Holden, P. B., Eliseev, A. V., Mokhov, I. I., Feulner, G., Kienert, H., Perrette, M., Schneider von Deimling, T., Forest, C. E., Friedlingstein, P., Joos, F., Spahni, R., Steinacher, M., Kawamiya, M., Tachiiri, K., Kicklighter, D., Monier, E., Schlosser, A., Sokolov, A., Matsumoto, K., Tokos, K. S., Olsen, S. M., Pedersen, J. O. P., Ridgwell, A., Shaffer, G., Yoshimori, M., Zeng, N., and Zhao, F.: Long-term climate change commitment and reversibility: an EMIC intercomparison, J. Climate, 26, 5782–5809, https://doi.org/10.1175/JCLI-D-12-00584.1, 2013. Zickfeld, K., MacDougall, A. H., and Matthews, H. D.: On the proportionality between global temperature change and cumulative CO2 emissions during periods of net negative CO2 emissions, Environ. Res. Lett., 11, 055006, 2016. Zickfeld, K., Solomon, S., and Gilford, D. M.: Centuries of thermal sea-level rise due to anthropogenic emissions of short-lived greenhouse gases, P. Natl. Acad. Sci. USA, 114, 657–662, https://doi.org/10.1073/pnas.1612066114, 2017. This study uses a global climate model to explore the extent to which sea level rise due to thermal expansion of the ocean is reversible if the atmospheric concentration of carbon dioxide (CO2) declines. It is found that sea level continues to rise for several decades after atmospheric CO2 starts to decline and does not return to the pre-industrial level for over thousand years after atmospheric CO2 is restored to the pre-industrial concentration.